Imagine an impressive Georgian manor style hotel situated adjacent to a 2800 acre royal park where herds of Fallow and Red Deer roam freely, there are stunning views across the River Thames dominating the landscape, and yet surprisingly it’s just a short walk from a charming town centre with excellent transport links to the centre of London. For the perfect venue to host either a wedding ceremony itself or reception and evening celebrations we doubt many locations could equal this – the elegant Richmond Hill Hotel in Surrey. Steeped in the history and heritage of its 17th century roots, Richmond Hill Hotel is a Grade II listed building has been refurbished to reflect the style and grandeur of the era. The hotel successfully maintains its Georgian character in the design and décor of its 142 rooms whilst also providing a range of modern conveniences, leisure and sporting facilities – swimming pools, spa, gymnasium etc – which are available to all wedding parties and guests. The stylish function rooms are ideal venues to host either wedding ceremony or reception events. Choosing between the elegant Ballroom with its traditional Georgian architecture – sash windows, high ceilings, ornate chandeliers, regal décor and space for up to 300 guests or the more contemporary Richmond Room with its private sun terrace, sophisticated lighting and space for up to 150 guests will probably be the one of the most difficult wedding planning decisions you will need to make. For smaller, more intimate receptions, catering for parties up to 30 in number, the recently refurbished Stafford Room, with its private balcony sweeping the length of the room, or the beautiful Queens Room with its traditional bay window overlooking the beautiful Surrey countryside are worthy alternatives. For a special touch, the hotel offers you total flexibility to host the wedding reception of your dreams. You have the freedom to either appoint an external caterer to use the on site fully equipped kitchens or take advantage of the comprehensive range of packages which the hotel provides. Packages for group catering can also include the hire of a cake stand and knife, menu cards, a toast to the newlyweds and the services of a dedicated event planner for the day. The hotel provides a wide range of seasonal menus to cater for all tastes and budgets as well as offering suitable options for children and vegetarians and it is always worth bearing in mind that the dedicated events planning team can also help with colour themes in decorating rooms, chair covers and table dressings. This service not only enables you to create a professional atmosphere for your guests but also eliminates a lot of the stress and worry associated with hosting such a memorable occasion. And of course, no wedding day would be complete without the creation of permanent reminders of those treasured personal moments. The light and spacious elegant interiors of the hotel together with its magnificent external views across neighbouring Richmond Park sets the perfect scene for capturing photographic keepsakes to be proud of. 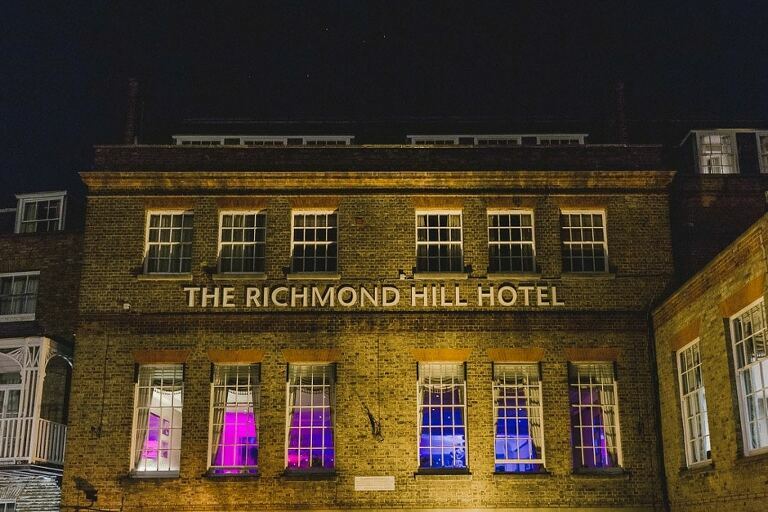 The Richmond Hill Hotel is unique – a rich slice of history, heritage and countryside tranquility combined with nearby town centre transport facilities, results in one of Surrey’s finest wedding venues. For other beautiful wedding venues in Surrey, take a look at the other fantastic venues I’ve had the opportunity to photograph. Address: 144-150 Richmond Hill, Richmond TW10 6RW. If you’d like to enquire about my availability for Richmond Hill Hotel please get in touch here.